What a fantastic December day at Topsail Island, NC! Amazing! Not just the weather was ideal—so was my beachcombing luck. Weather first: It never got below 60° overnight last night, and this afternoon the temperature hit the mid 70’s inland and near 70° here on the beach where the winds were as close to calm ALL DAY as you’ll ever have, yet BETTER than calm, because there was a persistent drift of air onshore keeping a gloriously fragrant sea mist wafting over the beach strand. The dew point (measure of moisture in the air) was a summer-like 60° or higher even though the beach water temperature was 58°. The humidity had its origin off to the south on the tropical Gulf Steam, brought in by the gentle south winds. Finally there was LOTS of sunshine yet muted by enough cloud cover to soften it, keeping the low winter sun angle from producing an uncomfortable glare as it glances off the ocean. To add icing on the cake, this morning’s sunrise was complex and interesting. I got up in time to watch it, going out on the beach barefoot to measure the water temperature as the sun made its first appearance above the patchwork of multi-layer clouds. Then I came back in and did several significant chores before leaving at 8AM for a serious beach walk during which I veritably soaked in the idyllic conditions. I drove down to the Mile 17 pavilion to start the hike (I live at MP 20 but, for variety, I don’t limit myself to local hikes) and hiked north to the Sea View fishing pier (Mile 18) and then south on a longer leg to the beach access point for the Trailer Park and little convenience store at Mile 14.7. The beach was even emptier than I remembered it from my walks in November—literally miles of beach that I had all to myself. The only place I encountered other people was at the very popular Mile 16.4 parking area—always infested with off-island locals and assorted day-visitors because it is directly across the high bridge from the mainland. 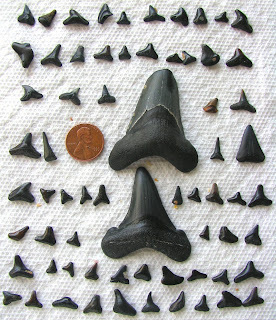 Now … on to the beachcombing news: along the way I lingered at several promising shark teeth deposit areas and netted 69 shark teeth for the day, including the biggest one I’ve found in almost six months of beach walks, easily eclipsing my previous prize in terms of weight, though not in quality. This new 40+ million year old Megalodon tooth (shown to the right of the penny) has its tip broken off. Oh, if only this tooth could talk and share the tale of its epic journey from the mouth of a living Megalodon (with a rich life surely full of intrigue and adventure so very, very long ago), through multiple cycles of sedimentation, deep burial, erosion and shoreline exposure before I finally chanced to find it today. My imagination ran wild as I imagined the endless possibilities. To try to gain some perspective on how much time this fossil has experienced, my mind wandered toward the future. Where will this tooth find itself a thousand years from now—long after I’m gone and forgotten? The tough minerals of these shark teeth are built for endurance—not so for my frail human bones (especially since I'm asking to have them cremated). A thousand years from now, will this fossil be abandoned and discarded in some landfill, or buried among the decaying ruins of some abandoned and forgotten human settlement? Or will it be held as a prized trophy in an ornate teak cabinet owned by some distant wealthy descendant? What about TEN thousand years from now? One hundred thousand years? What significance would this fossil have to the beings who are our successors in such a remote future, if any have survived? What about one million years from now? Would anything we know and hold dear today have any relevance to life in that distant time? And yet—daunting as it might be to imagine—a million years is insignificant compared to the span of time that this shark tooth has retained its identity in order to find its way into my hand. To me, the measure of a successful species is how long it manages to prevail as a force on this planet. Sharks are a remarkable success story. Humans, by comparison, can (up to now) claim to be little more than an ephemeral blip on the radar. Do we have any hope of surviving as long as the sharks? Or will mankind condemn himself to an early extinction? When I hold a 45 million year old Megalodon tooth in my hand, and let my imagination soar, I feel truly alive--a participant in an epic 13.7 billion year journey that has fashioned this reality. How profound is that!?!? It doesn't take a shark tooth. A rock will do--a plain, humble lump of stone whose composite protons experienced the first star formation, the super-nova explosions, aeons drifting as unconsolidated dust, then the magical consolidation into a solar system that somehow begat life. I absolutely relish exploring the unspoken but starkly real tale that such artifacts could tell; and this is the most central inspiration for my writing. My ‘magnum opus’—the trilogy of novels that I now have 80% finished—provides my honest ‘best guess’ answer to the question: what is the long-term fate of humanity. (Hint: we adapt, we survive 630,000 years at least. But every one of those 630 millennia was an epic struggle—think of any 1000 year segment of human history, how we pictured ourselves at the beginning, how we transformed ourselves by the end. And in the end, after more than half a million years, success came in many unexpected guises, not all of which we would recognize as ‘human’. But I digress. Forty-five million-year-old Megalodon teeth will do that to me. I finished my 6.89 mile hike at 12:30PM and headed back home. There I showered and sorted through the shark teeth and took and processed photos of them. The photo at the top of this entry shows most of today’s take of shark teeth along with the previous record holder, shown for comparison. Now on to the subject of human teeth, or lack thereof: In response to my three extractions of a week ago today, I continued to take near the maximum dose of aspirin to suppress the ongoing pain. But, given that chemical aid, the pain was clearly diminishing now, and quite rapidly. Meanwhile as the afternoon came, I tuned the TV to soccer—pre-game coverage and then live coverage of some potentially interesting UEFA Champion’s League games involving English teams. Unfortunately the live game, which kicked off at 2:45PM, turned lopsided quickly, leaving me free to remain on the laptop to run through the afternoon rounds with the game on only as background (and thus this lengthy post was born). Meanwhile (and this is the bit that is relevant to the Appalachian Trail journal), in Maryland (and all the way down the Appalachian Trail to Georgia) the weather today was unseasonably mild and humid (near 60 degree temperature and dew point), but intermittent rain started around midnight and persisted all day. So yesterday's decision to drive down to the beach was an obvious winner. It’s those kind of informed choices (after internet study) that I hope will enhance my effectiveness at hiking the AT next year. My plan is to remain flexible enough so that I can move (even a couple hundred miles) to where I can hike a section that is forecast to be dry and/or warm and avoid a section where it will be wet and/or cold.